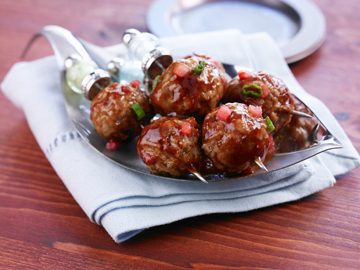 SUPER SUNDAY RECIPE #2 – WATERMELON GLAZED MINI BARBEQUE MEATBALLS - What About Watermelon? Since the crock pot full of meatballs is a staple at just about any football gathering, this dish should fit right in. I can almost guarantee these meatballs would be great as part of a meatball sub. Or maybe just consumed by the bowlful while being dipped in bleu cheese dressing. I should also mention that this recipe has only four ingredients. FOUR! And that’s including the meatballs! Heat the oil in a large heavy sauté pan over medium high heat or electric skillet set on 325°. Sauté the mini meatballs until browned and hot. Reduce heat to low. Mix together the barbecue sauce and watermelon puree. Pour over the meatballs and simmer for a few minutes. Serve hot. Serves 6 to 8.